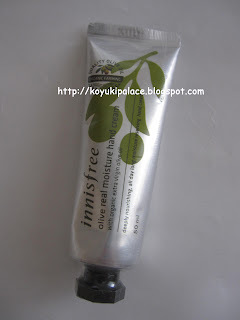 This is one of my favourite hand cream!! It was buy 1 get 1 free when I was in Korea! I didn't think how many I needed and bought 6! The cream is white in color and the texture feels like whipping cream! It's moisturises my hands deeply and absorbs fast! The light olive smell is mild and gentle. The packaging is light and easy to carry around. This is definitely one of the must buys in Korea ! !